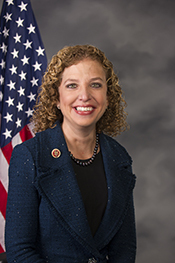 WASSERMAN SCHULTZ, Debbie, a Representative from Florida; born in Forest Hills, Queens County, N.Y., September 27, 1966; B.A., University of Florida, Gainesville, Fla., 1988; M.A., University of Florida, Gainesville, Fla., 1990; staff, United States Representative Peter Deutsch of Florida, 1989-1992; member of the Florida state house of representatives, 1992-2000; member of the Florida state senate, 2000-2004; elected as a Democrat to the One Hundred Ninth and to the seven succeeding Congresses (January 3, 2005-present). "Debbie Wasserman Schultz" in Women in Congress, 1917-2006. Prepared under the direction of the Committee on House Administration by the Office of History & Preservation, U. S. House of Representatives. Washington: Government Printing Office, 2006. Schultz, Debbie Wasserman., with Julie M. Fenster. For the Next Generation: A Wake-Up Call to Solving Our Nation's Problems. New York: St. Martin's Press, 2013.